For those of us who are out in the trenches educating our communities about the sources of their drinking water when it is groundwater, the question “Where does your water come from?” is often met with puzzled looks, especially from some of the youngest members of our communities – school-aged children. They may reply the faucet or the sky, but when pressed to guess, they often reply with some creative responses, such as the ocean, despite an ocean being hundreds of miles away. In the past year or so, another response has been, “the sewer,” which is mostly likely the result of the 2014 movie, “Teenage Mutant Ninja Turtles.” Sometimes the guess given is a body of water people are familiar with, such as a nearby lake or a river. In the city where I work, Memphis, Tennessee, another response I sometimes hear is the Mississippi River. Because Memphis is one of the largest cities in the U.S. that solely uses groundwater for its tap water, it is crucial that its residents know and understand the source of their tap water so that it can be managed sustainably. Part of my job is to educate the public about the source of its drinking water as well as why it is important to preserve and protect it. Memphis drinking water is highly praised by locals and visitors. Because it is abundant and of high quality, it is inexpensive, compared to areas where it may be scarcer and of lower quality. For many, it is easy to take Memphis water for granted. However, the biggest cheerleaders for Memphis groundwater are typically those who have lived elsewhere and those who have traveled widely. The cheerleaders know just how lucky Memphis is to have what is known as the Memphis Sand aquifer. Although I work with engineers and geologists in my role at CAESER, I am not one. It is my job to translate their research efforts and results into meaningful information for the Memphis area community. Because groundwater is not visible on the surface of the Earth, the way a river or lake is, even people who know water cycle concepts may not always know that the source of drinking water for our area is water from an aquifer. For those who do know that it comes from an aquifer, they may not know what an aquifer is, and they imagine it as an underground cave or lake. When it comes to educating people about groundwater, whether they are adults or children, there are challenges to overcome because groundwater is a something people cannot see. We may be able to explain the concept in a way that some people can understand. However, if we can show that same concept by using visuals, it is more likely to be understood and remembered. An ideal time to educate students about local water sources is when they are introduced to the water cycle. In Tennessee, state science standards require that the hydrologic cycle to be taught in the 5th grade. As a former classroom teacher, I know that the teaching profession is demanding and busy. Teachers often have limited resources. Since leaving the classroom, I have continued to work with teachers through outreach positions. When I reach out to teachers, my philosophy is that if I can make their job easier, I am more likely to have success in reaching their students. I build on what teachers are required to teach and try to supplement their efforts while extending student learning. They want their students to understand the hydrologic cycle and do well on state standardized tests. My goals are that students learn about their water resources and become good stewards of water, and that they understand how water connects to our daily lives. 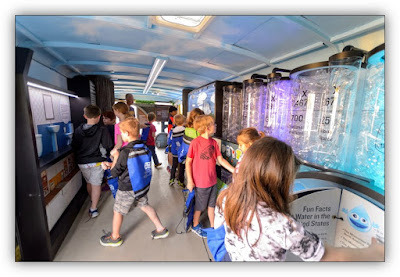 In trying to reach a maximum number of students, the idea of a traveling museum on wheels, or a mobile learning lab, seemed to be an efficient way connect with students from all over the city and to nearby areas, since they all use the same aquifer system. I wanted this museum on wheels to have the fun and excitement of a field trip, without the issues that sometimes accompany field trips, such as lost learning time, liability, cost, finding chaperones, and arranging for transportation. This mobile museum would be a fun experience as well as an educational one. Fortunately, the International Paper Foundation helped to make this dream a reality. 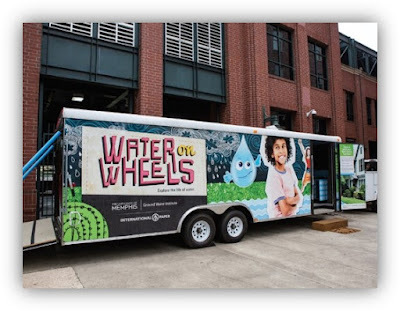 In addition to the $60K grant from the IP Foundation, my university based research center was able to utilize other campus resources to create the Water on Wheels (WOW) mobile. 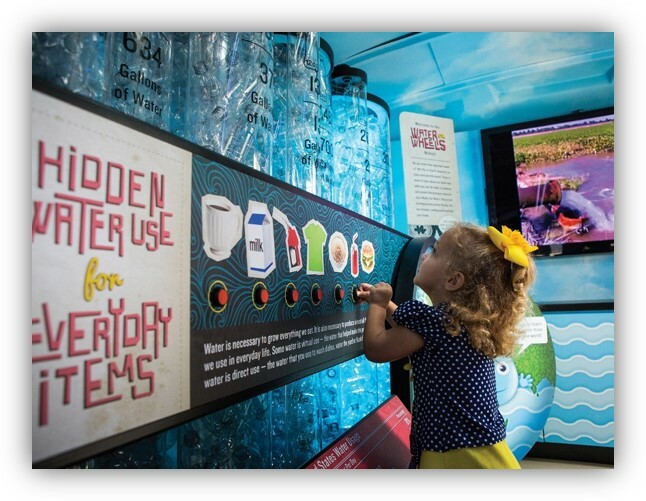 The WOW mobile now exists as a 24’ trailer housing interactive and colorful exhibits that educate visitors about the Memphis aquifer and other water related topics. 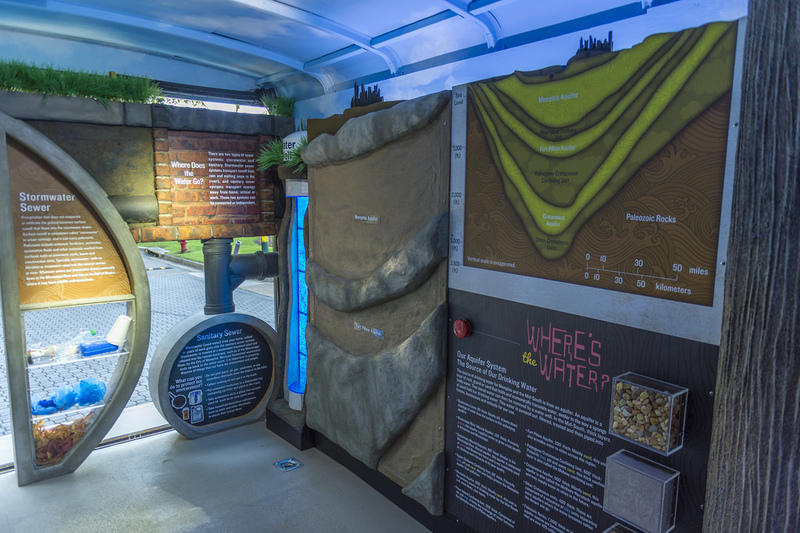 In creating the exhibits, I wanted visitors to have a comprehensive experience so that they could understand different aspects of water, yet understand that these aspects are connected. Visitors would be able to enter the trailer from either of the two doors and go to any exhibit as part of a self-guided learning experience prompted by their own curiosity and interests. The final product accomplishes this. However, in a school setting, we typically start with a bit more structure. Once in the trailer, a WOW educator will typically focus a group’s attention on one display and move to another display, guided by a group’s questions and interests. Some teachers prefer a more structured learning experience and the students will have a sheet of questions that encourage them to read the exhibits’ text panels in order to find the answers. Free time is a part of the learning experience, too. Free online lesson plans that complement the WOW exhibits are available, and some teachers will use these with their students prior to the WOW arriving at their school. A select group of teachers created these lesson plans, incorporating Common Core and Next Generation Science Standards into them. Since most students are introduced to the hydrologic cycle in the 5th grade, the lessons are designed for students in grades 4th through 6th. Although the WOW was designed primarily for students in 4th-6th grades, it is also appealing to adults. Text for the exhibits was crafted in a way that it would be appropriate for students in upper elementary grades, but adults will find the information informative, too. Both the interior and the exterior are bright, colorful and inviting, which was intentional. Since its debut in the fall of 2014, the WOW has been a tremendous success. Approximately 5,000 people a year experience the WOW, and if funding and staffing were available, it would reach even more people of all ages. When visitors experience the WOW, one might hear, “Oh, wow!” because it is colorful and engaging. When former WOW visitors makes a repeat visit, they often share what they remembered and learned, especially if they are a schoolage visitor. The WOW is the most popular education and outreach program for the Center for Applied Earth Science and Engineering Research (CAESER) at the University of Memphis. 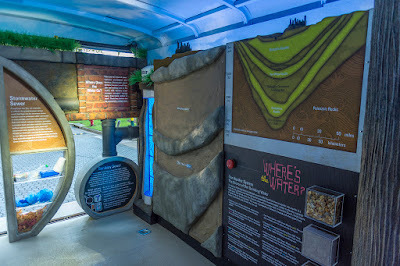 Although CAESER offers traditional classroom talks, career day visits, and hands-on activities such as building an aquifer in a cup, the uniqueness of the WOW makes it a sought after learning component for classroom teachers in Memphis and nearby areas, as well as a festival attraction. The WOW makes it easier for people of all ages to understand where their water comes from, where it is stored, and where it goes. As we continue to expand and develop our water education and outreach activities, we are looking at how to expand the WOW experience so that it continues to provide useful information to teachers and students in the K-12 community as well as the community at large. We know the WOW gives us access to our diverse city and community and we want to make it more accessible. We want everyone in our area to know where their water comes from and why it is so special. The WOW allows us to do that. For more information about the WOW, go to memphis.edu/wateronwheels or contact Michelle Dry directly at mdry@memphis.edu. For more information about CAESER, go to strengthencommunities.com. BLOG: What a Groundwater Week!